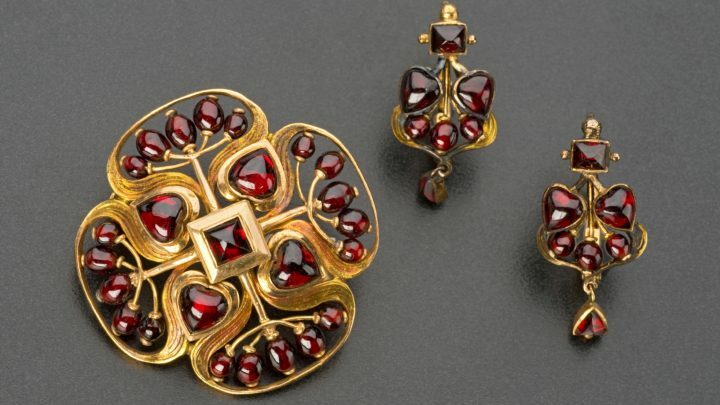 Art Nouveau gold and garnet brooch and a pair of earrings, by Josef Němec. Museum of Decorative Arts in Prague. 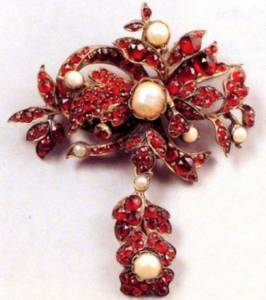 Garnets mined in Bohemia are of the variety called pyrope (from the Greek words pyr for “fire” and ops for “eye”). 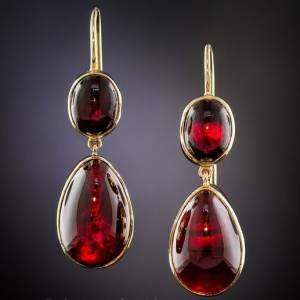 Of a rare high quality found in Central Bohemia in the north of the Czech Republic, the Bohemian garnet’s color ranges from fiery-red to ruby-red, and its deep coloring is not lost even in the smallest, two-millimeter grains. This semi-precious gem is well known as the January birthstone. Unusual Antique Russian Miniature Egg Pendants. made in St. Petersburg between 1904 and 1908 by Ivan Britzin silver egg pendants with 14K gold rings are pave set with rose cut red Bohemian garnets. The brilliant sparkle of the Bohemian Garnets is due to their excellent clarity, transparency and high refraction of light and therefore gained popularity in Europe in the 18th and 19th century as well as during the Victorian age. The traditional handcrafted Bohemian design places great emphasis on the arrangement of the garnets which dominate over the metal in each individual piece of jewelry. The stones are used not alone for jewelry and for ornamenting gold and silver plate, but also extensively for watch jewels and for polishing. The introduction of larger scale manufacturing of garnet jewelry created mass-produced machine pressed metal settings and garnets. It also required the introduction of a broad choice of to obtain commercial success. Garnet rings were generally made of facetted, rose or cabochon cut Garnets in 14 or 18 kt gold (George Frederick Kunz: Rings for the Finger). An antique Bohemian pyropse garnet hair comb, mid to late 19th century. 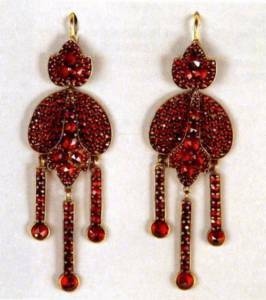 A pair of antique garnet pendent earrings, 1880s Of Etruscan revival design, the central garnet cabochons set within a circular gold plaque of applied ropetwist and bead decoration, suspended from a gold surmount of similar detail, with hook fittings, mounted in 14 carat yellow gold, length 4.0cm. 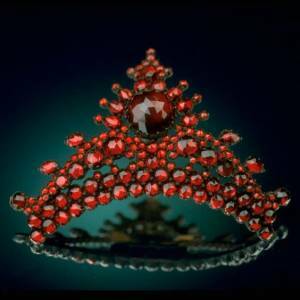 Although the Bohemian garnets have been known for many centuries, the industry of mining and cutting them on a large scale is said not to have assumed any special proportions until the advent of foreigners to Karlsbad. They spread a knowledge of the stones to other countries, and a demand sprang up which has led to the establishment of a great industry, and made Bohemia the garnet center of the world. 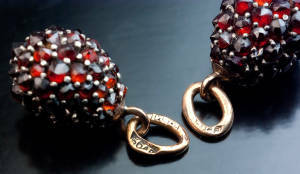 Antique Garnet Drop Earrings. 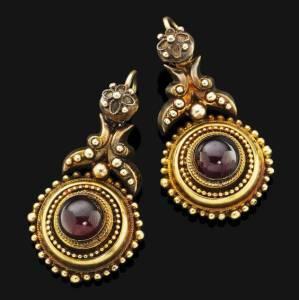 Glowing cabochon garnet drops swing-and-sway, to-and-fro and back-and-forth from matching ovals in these delightful, late 19th~early 20th century Bohemian (Czechoslovakian) ear drops crafted in 14K yellow gold. Lan Antiques. The Bohemian garnet has been mined for over 600 years mostly dug at the mines of Meronitz, Bohemia, and chiefly in the northwestern part, near Teplitz and Bilin in the Czech Republic. The garnets are found in a gravel or conglomerate of Cretaceous age, resulting from the decomposition of a serpentine. Sometimes, however, they are found in the matrix, and are then often associated with a brown opal. They are found by digging and separated by washing. Though of good quality the stones are small, those as large as a hazelnut being found but rarely. Image 2: The appearance of such articles in northern Italian or German collections may well have been the result of foreign trade activities of Czech garnet dealers who annually showed their products at European trade fairs and branches abroad. 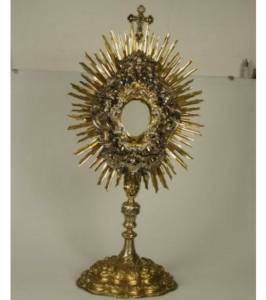 Image 3: A sensational discovery from the vaults of St. Nicholas Church in Prague, Thanks to restoration funded by the National Czech & Slovak Museum & Library, the monstrance, which is used in special Roman Catholic ceremonies, can be seen again for the first time since the exhibition in Prague in 1895. 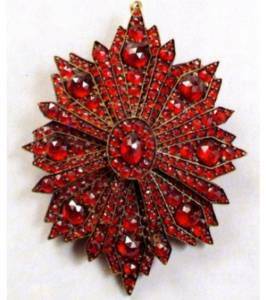 At nearly one meter tall, the curator from the National Museum, Dr. Dana Stehlíková (Stehlikova), believes it is quite likely the largest existing object decorated with Bohemian garnets. National Museum goldsmith Vladimir Cizkovsky completed the restoration work in Prague. Image 4: Mass production manufacturing was somewhat delayed compared to other areas of design, but the Art Nouveau mass produced designs were perpetuated that much longer, for example, in picture frames.